Fruitful experience has taught me that Dr. Science knows all the best food places. So when he suggested that we drive up to Morse Road yesterday, to try a place that serves authentic cuisine of Nepal and Tibet, I went along willingly. And that’s how I discovered Momo Ghar, which promptly vaulted into my top 10 restaurants of Columbus list. First, a word about the setting. Momo Ghar is located in one of the endless number of strip malls on Morse Road, inside the Saraga international grocery store. Momo Ghar is one of several independent food venues in the store, tucked into a tiny space back by the fresh fish section. If you want to eat there, you need to arrive early or late, because there are only five or so counter seats and two tables. Dr. Science and I got there a little after 1 p.m. and waited for a minute or two before seats at the counter opened up. Momo Ghar’s menu is focused on dumplings, which are either served doused in sauce, as shown above, or on a platter with sauce for dipping. The dumplings are steamed using contraptions on the stove, while the sauce merrily bubbles and simmers in the large pot located to the left of the cook in the photo above. The proprietress said she makes the sauce every day. We got three orders of dumplings — pork, chicken, and potato — and while we waited for them to steam up we gladly sat at the counter, taking in the sights and smells. Three orders is a lot of food for two people, but Dr. Science was confident we could polish it off, and of course he was right. We ate with greedy abandon and barely avoiding skewering each other with our forks as we shoveled the dumplings onto our plates. 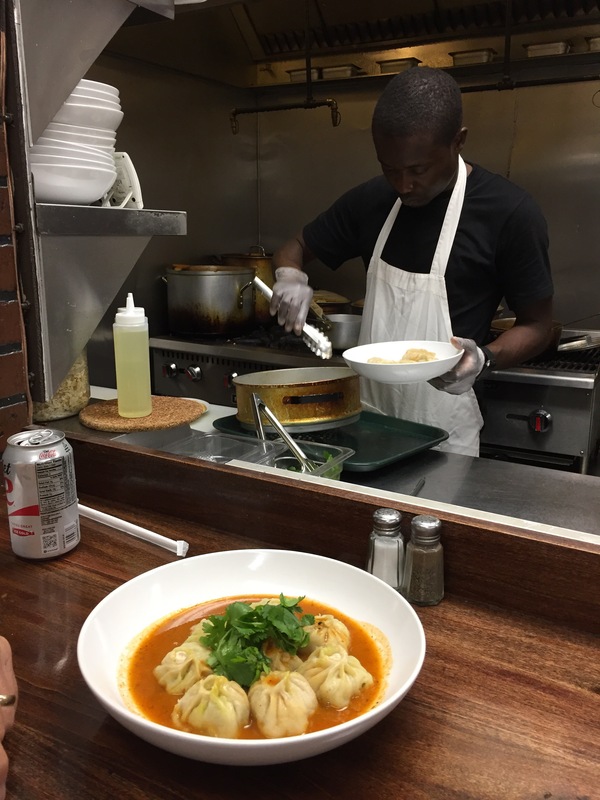 The dumplings are fabulous — moist, savory, and delectable — but the sauce is a stone-cold killer that has to be tasted to be believed. I’m not sure what’s in it, but it is an explosive combination of heat and flavor that bursts in your mouth like Fourth of July fireworks. My heartfelt advice to anyone who goes to Momo Ghar is: for heaven’s sake, don’t scrimp on the sauce! This food was spectacular, so I wasn’t surprised when Dr. Science said as we left that Momo Ghar has one of the highest Yelp ratings of any restaurant in Columbus. And this morning I learned even better news — Momo Ghar is supposed to be opening up in the North Market some time this fall, within easy walking distance from the office. Until then, I’ll be looking forward to introducing my office mates to the wonders of that fabulous sauce.